On the evening that Margaret Jacobson is going to get engaged to the love of her life, a shocking accident not only ruins the proposal, but severely wounds and almost kills her. In the aftermath, she is faced with the realization that her life will be completely different from this point on, and the people and things she thought were most important to her become almost insignificant as she wrestles with the understanding that nothing will ever be the same again. Brief summary, I know, but this book was SO MUCH MORE than any kind of summary I (or the publisher) can provide. On the surface, How to Walk Away seems like it would be saccharine-sweet, full of clichés about trying to rebuild life after a huge tragedy, learning what is “most important”, and uncovering deep secrets about family and loved ones. And it kind of is all of that – but in Katherine Center’s capable and creative hands, it is so much more. I absolutely loved Margaret and rooted for her the whole way through this book. At the beginning of the book, I found her to be shallow and a bit self-absorbed, perhaps a little too interested in the material things in life, but that quickly changed for me. When she began recovering from her accident, she turned into a person with sharp edges but a kind heart, a person who really started to understand what she wanted out of life. This transformation could have come across as inauthentic but it really was just the opposite – I totally believed Margaret’s journey and loved watching her grow into this more mature, more peaceful version of herself. It felt very real to me. There is a love story in the book but it is very soft, not a huge focus of the story at all. Ultimately it becomes A Thing, but it’s very sweet and done in such an adorable way – I loved it so much. The novel is so much more about Margaret finding her way, reconciling who she thought she was supposed to be with who she truly is, and realizing that her family is imperfect but she can still love them despite their imperfections and secrets that have been hiding for years. It’s a coming of age story, despite the fact that the person coming of age is a grown woman. I thought How to Walk Away was just so darn sweet and charming and I loved every minute I spent with it. These kinds of books just make me so happy and are exactly what we need to read sometimes to remind us that the world is not all darkness and sadness, at least not all of the time. Highly recommended for a fun, happy book to make you smile. Yeah, I could use a happy book right about now. I think you would LOVE this one!! It made me cry tears of happiness. So freaking sweet and charming. Yours is not the first really positive review I’ve read about this book. And I think a happy book sounds just about perfect right now. Thanks for reminding me about this one. Oh, and if you’d like another happy book, try Dear Mrs. Bird – WWII Britain during the Blitz. It’s about a tough time, but I loved it. I loved this book so much – I think it’s one of my favourites of the year. 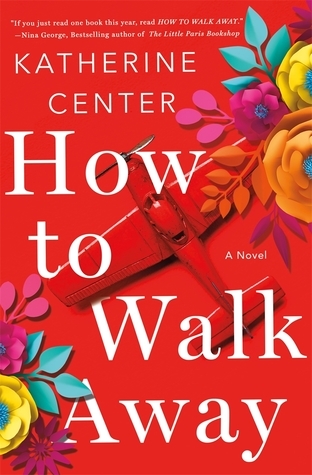 I’ve read 3 of Center’s books and loved them all! I have this book on my shelves and haven’t picked it up for fear it would just be sweet and shallow. I’m glad to hear it was more than that for you 🙂 I love the premise and would really like to see it done well. This book is on my shelf but your comments make me want to read it soon!